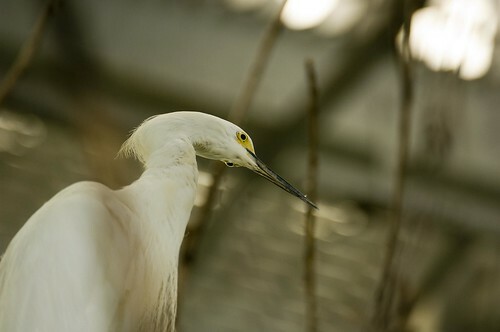 The snowy egret gets its name from its all-white plumage, although the species' black legs and yellow feet also distinguish it. Upon reaching maturity, adult birds develop long, fine plumes of feathers along the chest, back and neck. 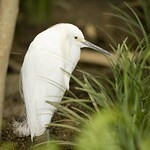 The snowy egret can be found throughout North and South America. This heron species prefers to inhabit the shallow waters of bays, inlets, swamps, ponds and lagoons. 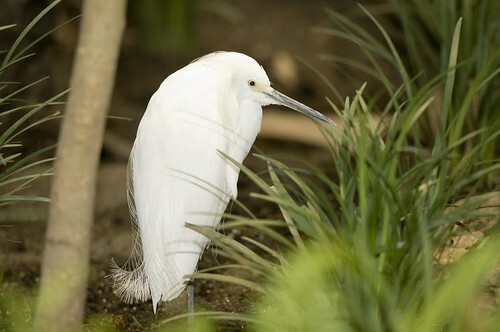 The snowy egret preys on a wide variety of creatures both in and out of the water. The bird's large bill can be used to grasp prey ranging from earthworms and insects to fish, snakes and lizards. Males attract mates by performing vocalizations and displays such as bobbing motions delivered with the bill stretched toward the sky. The female builds her nest from sticks and twigs, and both parents contribute to the incubation and rearing of young. 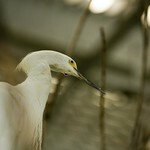 The snowy egret's long, thin toes enable it to step easily through the water.